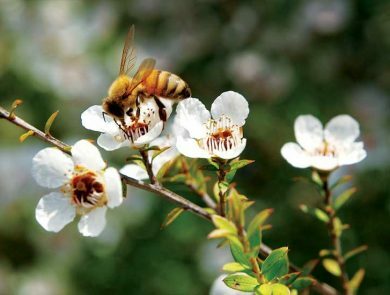 There are significant plans for the development of Manuka Honey in the Peel and South West of Western Australia, and it is intended that this area will become a global center of excellence for the development of premium quality Manuka honey for medicinal pharmaceutical and premium food industries. This is the vision of Western Australian company ManukaLife, which is focused on building a sustainable honey industry of propagation, plantations, growers, apiarists, product processing and manufacturing and downstream product and distribution channels- creating an efficient commercial model. ManukaLife and the Australian Federal government Rural Industries Research and Development Corporation (RIRDC), in collaboration with Kings Park Botanical Gardens, have entered into a three year research agreement to conduct plant breeding for high grade plants that will ensure superior genetics to supply high grade medical Manuka honey. In 2016, ManukaLife planted 150 hectares and has commenced planting a further 500 hectares of the Leptospermum plant species across a limited number of sites in the Peel and South West, in share farming arrangements with landowners. In 2018 ManukaLife has plans to expand plantings by an additional 1000 hectares– this will deliver critical mass in honey supply andenable establishment of research and development (R&D), manufacturing and off take agreements. Manuka honey is useable across a growing number of industry sectors including cosmetics, medicinal, nutraceutical and pharmaceutical. For example, in the medicinal sector,scientific studies have shown that Manuka is effective in preventing methicillin resistant StaphylococcusAurens (MRSA) superbugs. Bacterial sepsis kills 170 Australians a week and costs more than $1 billion in direct healthcare costs. In the US, costs are estimated at $34 billion per annum with over 8 million hospital days involved in sepsis cases. ManukaLife is a core participant in the recently established Honey Bee Cooperative Research Centre, led by the University of WesternAustralia. Dr Liz Barbour, from the UWA’s Office of Research Enterprise, said the CRC for Honey Bee Products would be working to resolve current industry problems that limited the value and expansion of the honey bee products industry. Dr Liz Barbour also said that “Australia, especially Western Australia, has one of the healthiest honey bee populations in the world, so no antibiotics or chemicals from bee husbandry contaminate products. Whilst Australia is surrounded by bee disease, the worst have not yet reached our shores”. The CRC will align with Australia’s ‘clean and green’ marketing focus and this will be supported by the development of a ‘chain of custody’ from the bush to product. The research network will be expanded to include US, China and Europe so that international research on disease genetic markers can be integrated into the local honey bee population.